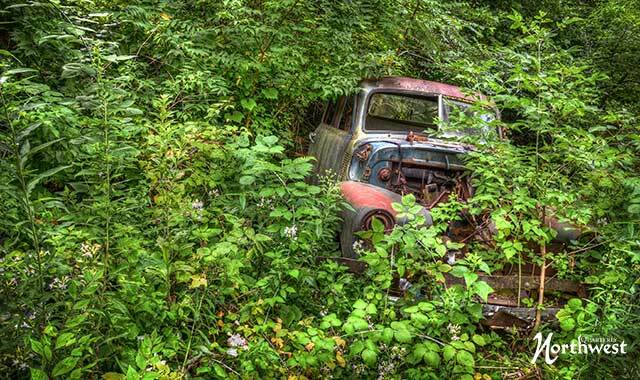 Touring the backroads of the Midwest, photographer Tom Holoubek captures the fading, forgotten automobiles abandoned to the elements and forgotten by time. What stories could they tell of days gone by? This truck was found in South Beloit. 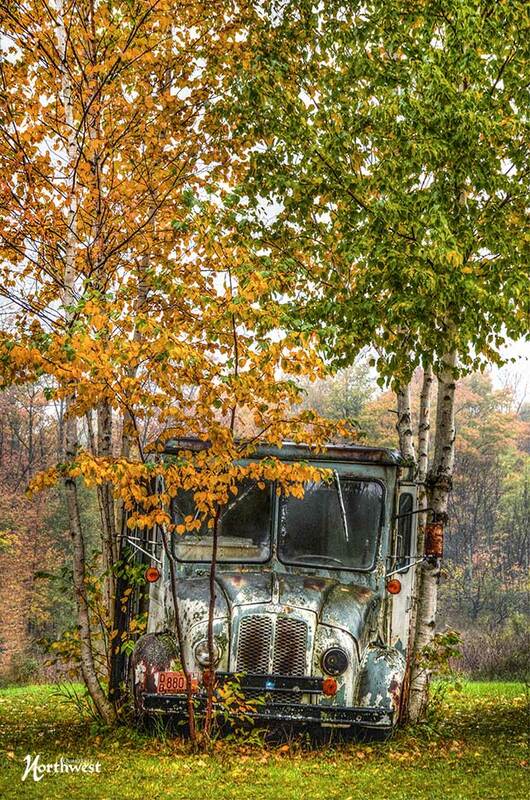 I love how the trees and weeds have overtaken the truck. It gets lost in a sea of green, and that contrast draws me in. It’s up to the photographer to bring out something interesting in the subject. 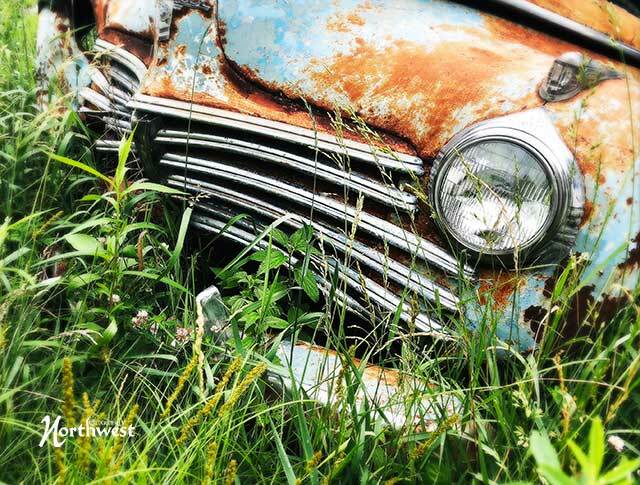 I look for details like grass sprouting out of the bumpers, maybe a patch of rust, or that one headlight still intact. The interior of this car was photographed in Pella, Iowa. 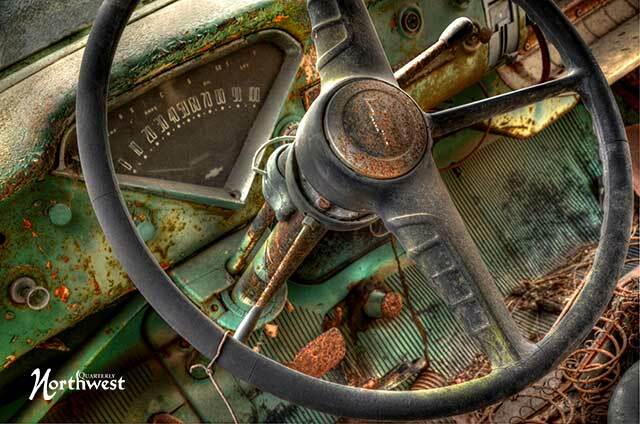 Every time I stop to photograph an old car or truck, I look inside. You never know what you might find: old keys, a broken speedometer, shapes in a broken window. The lights and shadows create unexpected designs. You might even find a cool spider and its web. All of these elements can add an interesting composition to your subject, enhancing the story. I had passed by this auto once before, but couldn’t stop. I waited for a foggy morning and ran out early before work. Shortly after the photograph was taken, the car was removed. As I travel, I’m conscious of the fact that I may never make it down that road again, so I make the most of that moment in time. I will photograph night or day, rain or shine, and I often dredge through snow. There are times when the light just hits the subject at that perfect moment. I find older cars and trucks to have the best shapes, styles and colors. 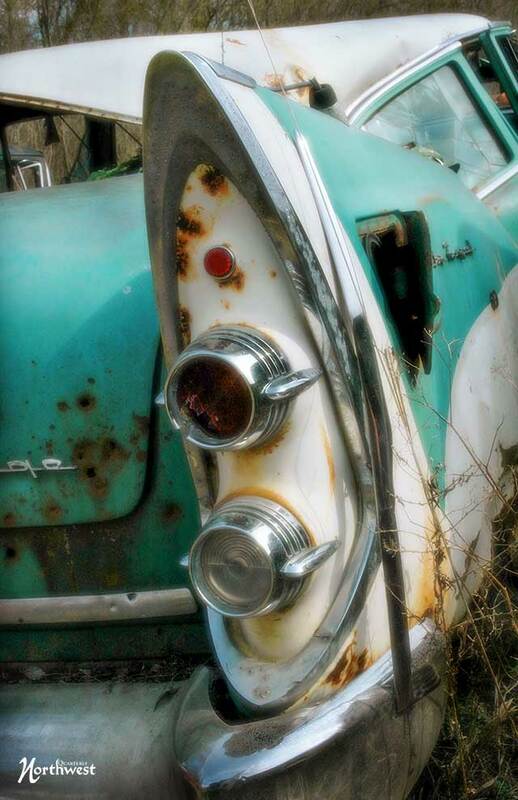 Oftentimes they are dented, rusted and faded, which adds to their mysticism and my creativity. Every day, I pass by old cars and trucks just sitting along the roadside, and in some way I’m drawn to these forgotten and lonely machines. Each one has a story, each once was new; now they’re forgotten, weeds growing around them. I find this infinitely interesting. It’s the one subject in photography that never gets boring or old. 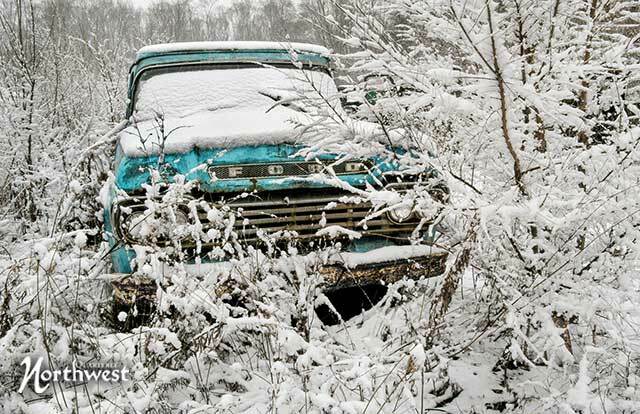 This old truck (above) was found in Roscoe. This is one of my favorite photos. I love the simple pop of color from the truck, framed in the white of the snowy morning. I try to revisit my subjects throughout the year. Each subject can look different in spring, summer, winter or fall. As I was driving to my hotel after an assignment, I came across an old auto graveyard on the side of the road. The salvage yard has become a huge source of photographs over the years, and I try and stop as often as I can. The heavy rain on this day didn’t stop me from walking back to the stash of vehicles I love. The fall season is my favorite time of year to photograph these old cars. 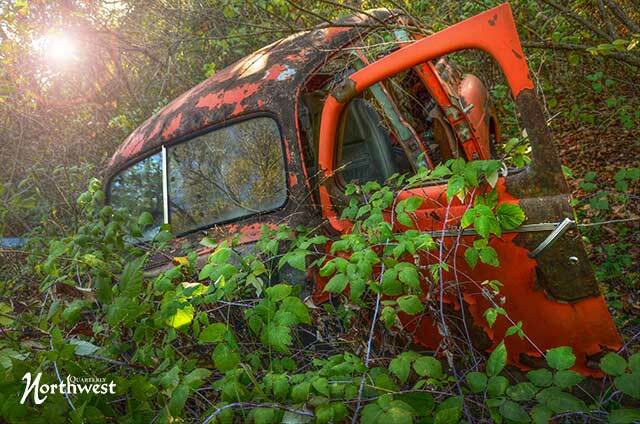 This work truck was photographed in Door County, Wis. I found it fascinating that it was framed by these colorful trees, and I loved the foggy morning setting. I prefer to shoot this type of photography on gray, cloudy days. I find that sunshine oftentimes causes unwanted shadows and contrasts. On muted days, you get more color and detail in the subject. It’s an approach with which I have found much success. This car was found in South Beloit. Tom Holoubek is an Illinois-based photographer working professionally for more than 35 years. Based in the state-line area, Tom has been published worldwide in magazines, newspapers, websites, online zines and billboards. Currently a Google-certified photographer creating virtual tours across the Midwest, Holoubek has also worked in newspapers and live TV. His photography is on display at 317 Studio, in Rockford, and Rockford ArtScene. 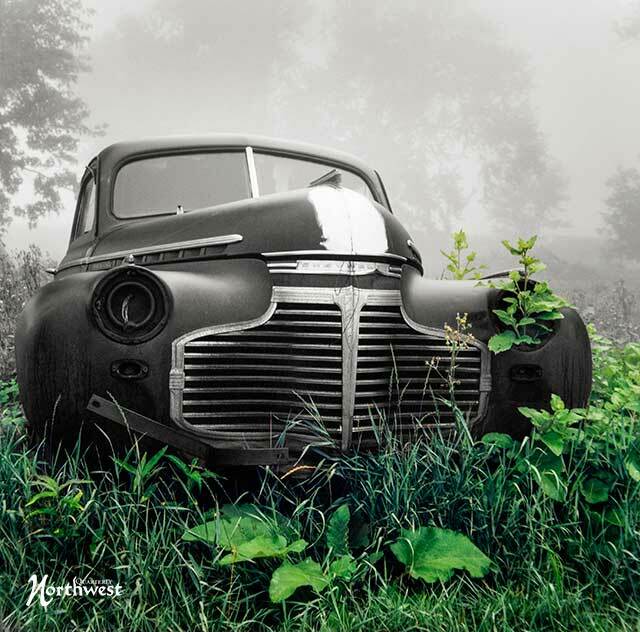 As he tours the country, Holoubek enjoys photographing old cars and trucks along the many back roads and highways of the Midwest. 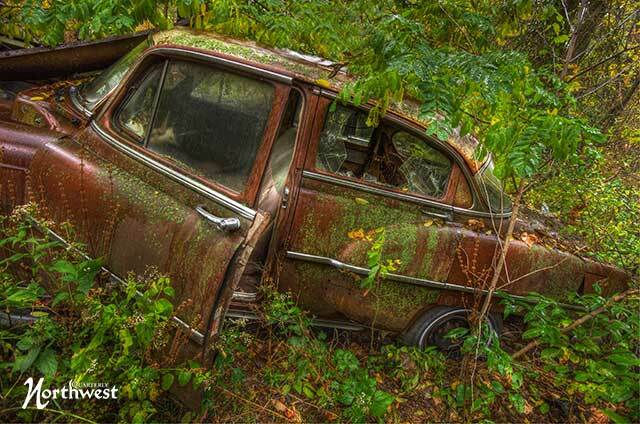 As he snaps photographs, Holoubek reflects on the memories these cars could share.